Now is a good time to get some sweet mangoes to make this much loved dessert, Thai Coconut Sticky Rice and Mango. This is one of the must have desserts in Thailand or in any Thai restaurants out of the country. It is definitely one of my family’s favourite desserts. How about you? 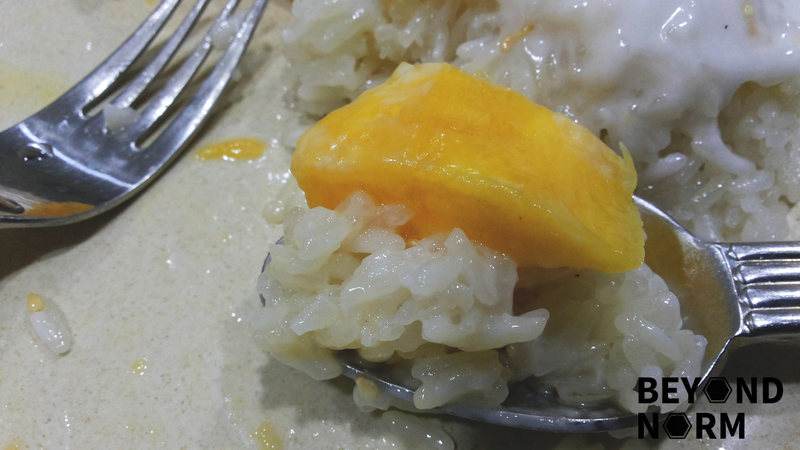 This dessert usually comes with a bed of sticky rice which has been infused with sweetened coconut milk and accompanied by slices of freshly cut mango and sometimes sprinkled with toasted white sesame seeds or mung beans to add some flavouring to the sticky rice. A simple and easy to make dessert that will impress your family and friends. 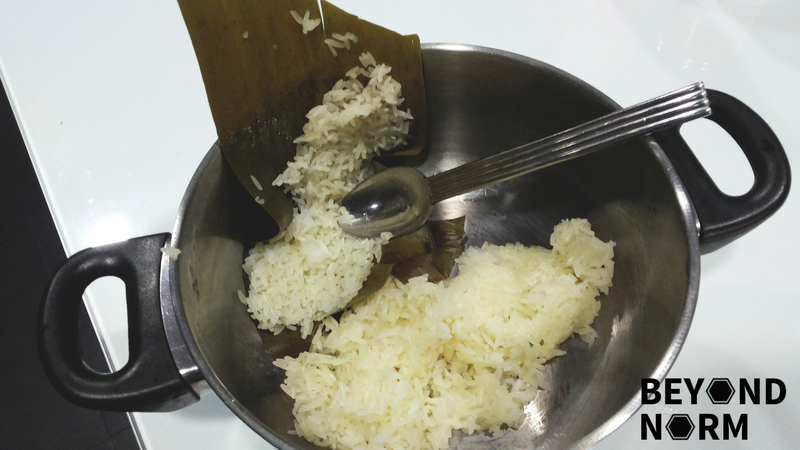 Soak glutinous/sticky rice for at least 6 hours or overnight. Rinse as many times as possible to get rid of the starch and drain well. 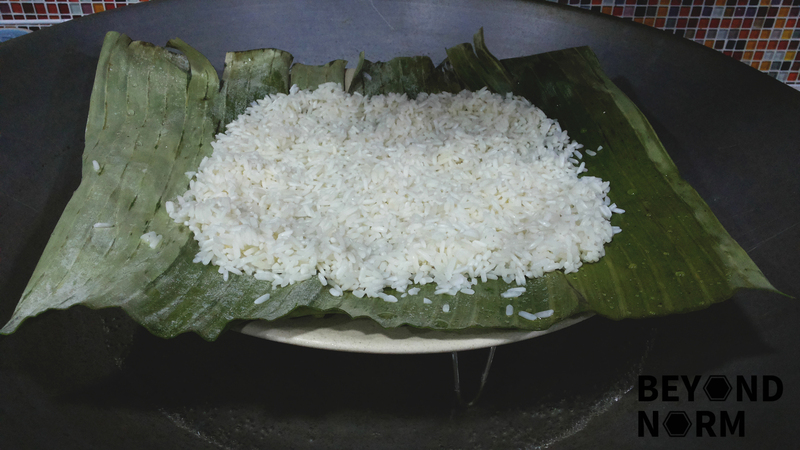 I spread a banana leaf on the plate and put the rice on the leaf or you can put the rice in a heatproof bowl and steam in a steamer, over medium heat for about 40 minutes. 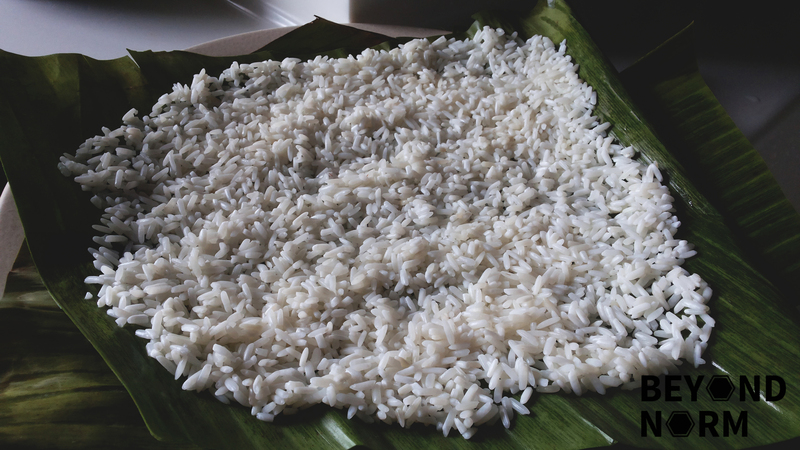 When you do not see any hard, raw bits in the middle of the grains the rice is considered cooked. 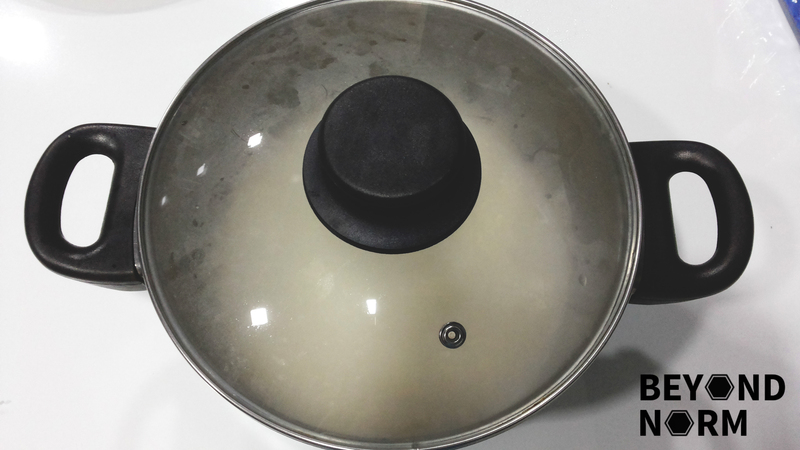 Once the rice is cooked, turn off the heat and let the rice stay in the steamer with the lid on while you prepare the coconut milk. 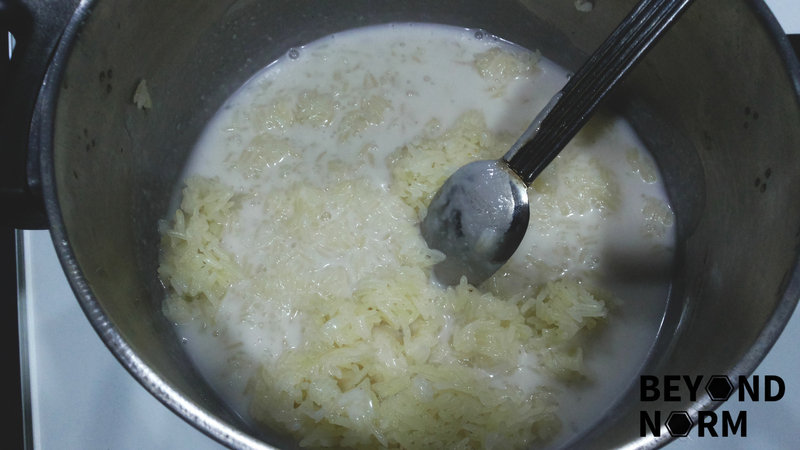 In a pot, add in the coconut milk, sugar and salt. Heat them over medium low heat. Stir all the ingredients till the sugar is dissolved and the mixture is very hot. Cover the pot tightly with the lid or plastic wrap and let the mixture stand at room temperature, undisturbed, for half an hour or more. The coconut sticky rice is to be served at room temperature along with cut fresh mango either at the side of the rice or places on top of the rice. Drizzle 2 to 3 tablespoons of coconut sauce over the rice and mangoes. Then sprinkle with some sesame seeds and serve.